14,700 years ago, in a cave in Somerset, our ancestors were eating other people. Museum research reveals these Ice Age Britons weren't eating human flesh out of necessity but as part of a ritual. 'The evidence at Gough's Cave points to a sophisticated culture of butchering and carving human remains,' says Dr Silvia Bello, a Museum scientist who investigates the evolution of human behaviour including funerary and cannibalistic practices. Prehistoric human remains belonging to several individuals, including a teenager and a child around three years old, have been found in the cave and show clear evidence of cannibalism. Many of the bones were chewed by humans. Long bones and ribs had been cracked open and gnawed to extract marrow and grease. Other bones show cut marks where soft tissue has been meticulously removed. Three skulls were carefully shaped to create cups or bowls. One of the most fascinating finds is the recent discovery of zigzag marks carved into a forearm bone to create an intentional pattern, as Silvia discusses in the video above. But what was behind this behaviour? Cannibalism may be a reminder of the dark and gruesome side of human nature, but it can also be an example of complex behaviour, symbolism and the external manifestation of a belief system. The early modern humans living at Gough's Cave were Magdalenians, a cultural group of Cro-Magnon hunter-gatherers from southwest Europe. The Magdalenians probably entered Britain from Belgium and the Netherlands around 15,000 years ago, as the climate began to warm up. A land bridge still connected Britain to central Europe. These Palaeolithic people were skilled toolmakers. As well as thousands of flint tools, excavations at Gough's Cave have exposed objects carved from ivory and reindeer antler, and awls (used to pierce holes) created from the bones of small animals. Magdalenians left many tools and artefacts in Gough's Cave, including this perforated baton made from reindeer antler. Its function is unknown, but decorated examples suggest they were valued items. Horses were a major food source - horse bones found in the cave often bear cut marks and breakage patterns consistent with the extraction of nutritious brains and bone marrow. Other animals such as deer, grouse and hares supplemented the Magdalenians' diet. Radiocarbon dating revealed the human and animal remains were deposited over a very short period of time, possibly during a series of seasonal occupations, about 14,700 years ago. This suggests the people returned to the area for short-term reasons such as hunting, and possibly for burying their dead. Cannibalism: for survival or ritual? The apparent abundance of animal meat suggests there was more to the prehistoric cannibalism at Gough's Cave than satisfying hunger, says Silvia. Detailed analysis of the human bones by Museum scientists provides further evidence to support this. Making containers out of human skulls may sound macabre, but the practice is well known worldwide. It has been documented from the Vikings and Scythians to recent peoples. The human skull-cups found at Gough's Cave are the earliest directly dated examples known. 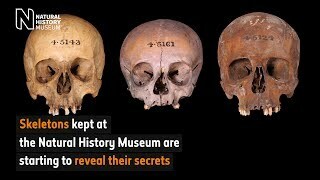 Museum analysis of the modified skulls highlights the way in which the Magdalenians prepared the skull-cups. Silvia says, 'The skulls were scrupulously cleaned of soft tissue shortly after death. Marks show cutting of the lips, cheeks and tongue, and extraction of the eyes. The painstaking preparation of the skull-cups suggests they were prepared for a special purpose rather than just for nutrition. After all, it would have been much quicker and easier to just smash the skull to access the fatty brain inside. 'Evidence of skull-cups at two other Magdalenian sites - Isturitz and Le Placard [both in France] - is another clear indication that the shaping of skulls might have a symbolic meaning,' adds Silvia. The engraved forearm bone further supports the idea that the people living in Gough's Cave were practising cannibalism for ritualistic purposes rather than as part of a survival strategy. Using 3D microscopic analysis of the various modifications, Museum researchers were able to determine that the forearm was first filleted and chewed, then the bone was engraved with a zig-zag pattern using the same stone tool before being broken to extract the marrow. Gough's Cave is located in Cheddar Gorge, a limestone gorge in the Mendip Hills near Bristol. The cave has been an important archaeological site since the nineteenth century. The cave's most famous body - a modern human known as Cheddar Man - was unearthed in 1903. His near-complete skeleton has been dated to around 10,000 years ago. Ancient human burial sites are extremely rare. However, many ancient human remains have been unearthed over the years from Gough's Cave, particularly during major excavations in the late 1980s and early 1990s. Upper jaw of a teenager. Found at Gough's cave, this 14,700-year-old bone is in two parts with cut marks where flesh has been removed. Why did the rituals take place? Although Palaeolithic cannibalism, at least for the people at Gough's Cave, appears to have been a cultural choice rather than a necessity for survival, it is no easy matter to try to understand the reasons behind the rituals. There are no visible signs on the skeletons that the individuals suffered violence before they died, so their deaths may have been due to natural causes. Silvia speculates that the engraving of the human bone may have been a way of remembering the deceased's life or death, but she emphasises that we can't do more than guess. Silvia hopes that future discoveries may bring us closer to an answer. Loan of the Gough's Cave human material to the Museum is made possible thanks to the generosity of the Longleat Estate. Unearth the one-million-year story of humans in Britain and their struggle to survive in a changing land. Discover how the changing climate of the past million years affected Britain's coastline and the presence of humans.